Ammeter selector switch is basically a normal three position switch. In large Electrical distribution panels, an ammeter is used to monitor the current through each line. The basic idea behind the use of ammeter selector switch is to reduce the number of ammeters used to monitor line currents. Otherwise in a three-phase system in order to monitor current in each line separate, ammeters have to be used in each line. In order to avoid that, an ammeter selector switch is used to select the line in which the current is to be monitored. 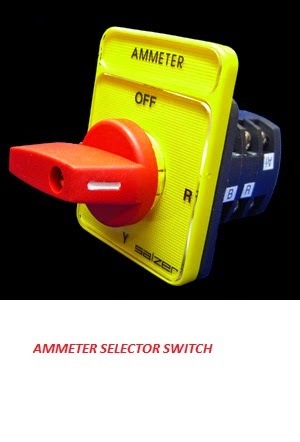 Simply speaking, in order to reduce the number of ammeters one can use an ammeter selector switch. Currents transformers should be placed on each line and the outputs of current transformers are connected to this ammeter selector switch. Why should we use an ammeter selector switch? If you want to save money just use it. Otherwise, we can use three different ammeters for each phase. If you want to monitor the line currents continuously, it is better to use separate ammeter on each line.